T-minus one day until I leave for Disney. I get excited, but I tend to keep it all inside. The planning that has so far gone into our trip has been great, but it’s nothing my sister couldn't handle (seriously you should see our spread sheets.) For my birthday last month she gave me one of the coolest presents, my very own Unofficial Guide: Walt Disney World 2011 *DING*. I thought I knew a lot, but it has been a really interesting read and a great research tool especially when there is no computer around. The sheer amount of information, diagrams, charts, and extra tips and info in the margins is incredible. Thanks, Sis, this has been worth its weight in gold for getting ready, even for experienced travelers such as ourselves. I think the section: Waiting-Line Strategies for Adults with Young Children is going to be something good for us and something I will be passing on to our cousin and his family who will be joining us on their vacation on October 31. I have also been trying to make sure I am up to date on all of my podcasts. When it is coming down to the wire on trip time, I pick up a few new ones just to make sure I have heard all the new info I can. WDW Today, WDW Radio, WDW News Today, BetaMouse and the Inside The Magic are my usual go-to podcasts. Followed by Netcot, the Dis Unplugged and Mouse Guest Weekly. I think between these and a few others I have all of my bases covered on all the news that is the news in my Mouse related endeavors. Also blog reading takes a huge jump. Now not only do I have to write one, I need to read as many as possible just to stay up to date. Some people don't understand why I (and the we that is my family) put so much time into planning a vacation to a place we have visited so many times. All I can say is; how can you not? But that is a topic for another time. I have been thinking all week (month really) about what I need to pack. This year I have what seems like the most extra stuff I have ever carried. Normally I carry only what I can fit into my pockets, cargo shorts to be exact. However to my complete surprise for my birthday last month my parents gave me a new DSLR camera, a Canon T1i. So now I am keeping track of a large camera, bag, monopod, tripod and extra lenses that have been graciously loaned to me by a good friend and new family member, my cousin's wife Emily (thank you again MRS. Ridgeway!) She is awesome and has been into photography for some time, so she has several extra lenses and, lucky for me, trusts me to take care of them. The one I am most interested in is a 75-500mm zoom. I am hoping to be able to take some pictures of the space shuttle on November 1. 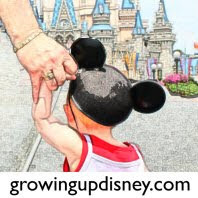 Also my preparations include checking in with my cousin Jeff and wife Windy who, if you have been following along with us for a while, are taking their children on their first trip to Walt Disney World. This is also Windy's first trip and Jeff's first trip since he was about 8 years old. So for all intents and purposes, it is Jeff's first trip too. They received their final itinerary from their vacation planner. They are going to be using the Disney Dining Plan and have ADRs at Brown Derby Monday, Crystal Palace Tuesday, Le Cellier Wednesday, Yak & Yeti Thursday then a free day on Friday. They weren't able to get into Chef Mickey's but I am sure they are going to still have a great time. I reviewed the packet they received and explained some of the materials. I explained how the online early check-in works while also making some suggestions as for some things to make the kids experience a little more special. One suggestion I had for them is to get the girls their own disposable cameras. That way they can take pictures of what they want, the cameras are inexpensive and they can make their own photo albums when they get home. Another suggestion was to use the Photopass system. You don't have to buy all or any of the photos and you can have the photopass photographers take a picture with your camera as well. It just makes things a little easier and lets you be in some of your own family pictures. Also I was able to order them the custom Disney Park maps that are offered for free, so that will hopefully be a nice piece of memorabilia for them. Do you have any suggestions on some ways we can help make their trip special and as worry free as possible? Good post Little Brother! See you real soon! I "discovered" the Unofficial Guide a few years ago. Like you, I thought I knew so much until I read this book. I had borrowed it from the library but soon decided it was definitely the perfect addition to my own home library. I have purchased it every year since. Plus, since I own the book, I could subscribe to their website for 50% off (though their site is worth every penny of the full price!). By the way, great tip about the photopass photographers. We always have them use our camera to take group photos and they are always accommodating! It's funny because I just posted that in my article for my column this week. Enjoy your trip and good luck with your new camera! great post! have fun on your trip! !